The thrilling 15′ Tropical Dual Lane will keep you mezmerized with thrilling hieghts and non- stop excitement in a tropical setting. The slide is fast and has a wonderful refreshing addition to any party. It is a great theme for any event and party. 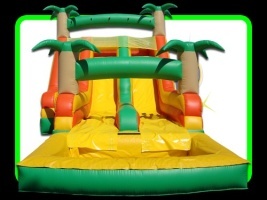 JumpMaxx prides ourselves in providing America with newer, cleaner, high end entertainment with inflatables like the 15′ Tropical Dual Lane and many others.